When disaster strikes, survivors suddenly find themselves in a world that has become confusing and unfamiliar. Such traumatic events impose severe psychological strain on every member of a community, but children are a particularly vulnerable group requiring special attention. 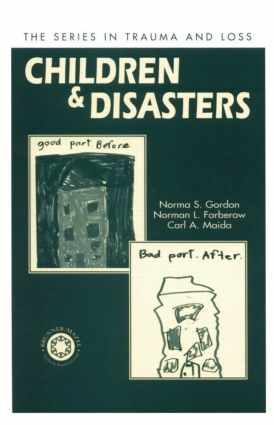 Children and Disasters addresses the needs of this specific population by examining the impact of major disasters on the mental health and emotional functioning of children. The programs described in this book are designed to provide early intervention to children and families undergoing stress reactions to a catastrophic event. The authors offer interventions aimed at enhancing the skills of mental health professionals, educators, and peer counselors in responding to the intensified demands of disasters. These intervention approaches provide information regarding the event itself, reinforce the legitimacy of the anxieties and fears that children and their families are experiencing, and encourage the expression of feelings in group and individual settings (for the younger child, through drawing and play). Furthermore, they build on the coping capacity of individuals and theirs families and provide concrete coping skills and techniques to alleviate stress reactions. The intervention model can be applied to programs for individual children and their families, multi-family groups, and groups for children in mental health, educational, and community settings. The practical "hands-on" approach to program design makes this book an attractive resource for mental health professionals, social workers, rehabilitation specialists, professional and volunteer counselors, and suicide intervention workers. It will also be useful for school personnel, including teachers, school counselors, and administrators, as well as federal and state emergency planners and coordinators.